Bulk change feature helps saving a lot of time and instead of changing a specific setting in each system element separately it allows changing the value of a certain field (setting) for the several selected elements. 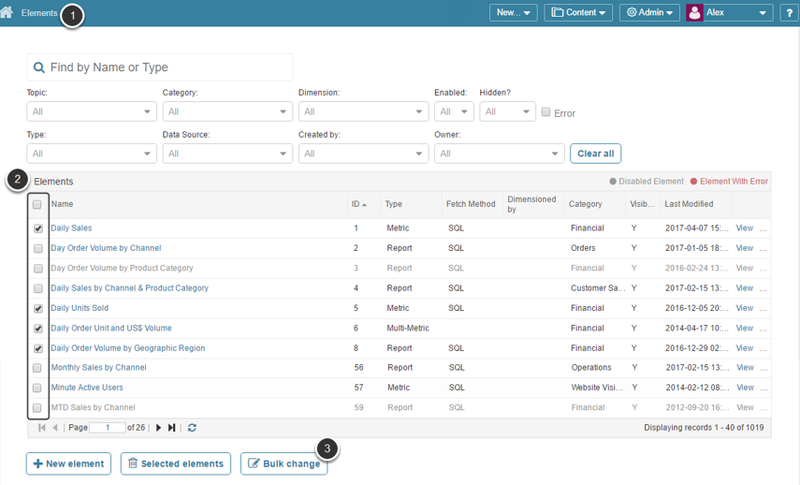 Bulk change feature is available for all system elements: Metrics, Multi-Metrics, Reports, External Reports or Other External Content. The Choose field and New Value pop-up opens. Business Owner: Select a new business owner of the defined elements from the drop-down list. NOTE: Making either a Regular or a Power User the Business Owner of any Element provides NO View Access to the element or access to its Dimension/Values (if any). Data Collection Trigger: Define a common trigger for the selected elements by choosing one of the Data Collection Triggers from the drop-down list. For more details, see: What are Data Collection Triggers? Statistical View - Standard Deviation: Provide the value of Standard Deviation and leep in mind that it will be recalculated for the ENTIRE metric history and affect all alerts on 'Unusual Value'. For more details, see: How are Moving Average and Standard Deviation calculated in MI? Enabled/Disabled: Define whether selected elements should be enabled or disabled. NOTE: Only elements that have been successfully validated will be enabled. Global Access: Setting access to public will make elements accessible to everyone, regardless of account login. Visibility: Define whether the element should be visible on the Homepage. 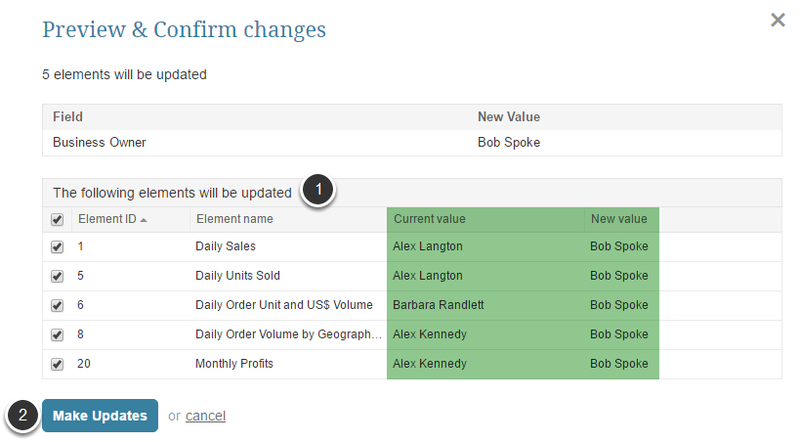 Preview the changes to be applied in the Current value and New Value columns. At this point you can still exclude unnecessary rows by clearing their check-boxes.